Thanks to all of you who have supported us over the last year. 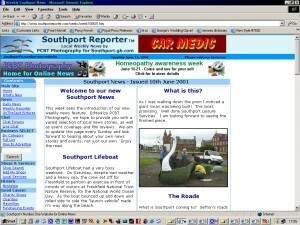 We have grown and grown and now we are officially 1 year old official this week as SouthportReporter.com! "This is a fantastic achievement for us. It has been a up hill struggle but we are now starting to make headway! We had started out with just one page and thought it would take us years to achieve the results that we have now. We have had interest and support from all types of media from local papers all across the world to national and international newspapers. We have even had support of TV and Radio. Now we have more news that ever and we are expanding the site to cope. We hope you the reader will enjoy our service for years to come and we again pledge to follow the NUJ code of conduct and also to help the community to the best of our abilities." Owner and Editor Patrick Trollope BA(Hons) LBPPA. Men's Health Week 10 - 16 June. Macmillan Cancer relief's band plays on despite problems! Formby arts Festival updated information and samples of music. Happy Birthday To Ian Lowe who is 27, you old fart from Eric. Happy Birthday Angie from everyone who knows you, see you Friday.